Practice problem solving, estimation, measurement and other math skills by making ice cream! Cooking activities are great for teaching kids how to use measurement tools, giving them a chance to apply math skills like counting, adding, multiplying, etc. In addition, when you give them a chance to design their own recipe, children have to rely on estimation, problem solving and other critical science, math and engineering skills. For this first session, you will only be using cream, sugar and vanilla as ingredients, and the 2 sizes of Ziploc bags, ice and salt as materials. Management of the ingredients will be much easier if they are divided into several cups, with 2 or 3 teams sharing a set of cups. Make sure to label the cups with the ingredient that is in them—sugar and salt can look very similar! For an even more satisfying method, check out the Ice Cream Science – A New Recipe activity, which uses buckets of ice and coffee cans. Ask your students if they have ever made ice cream at home before. How did they do it? What flavor did they make? Did they ever try to invent their own recipe? Have them brainstorm a list of ingredients they think are needed to make ice cream. Once you have a list, tell them that they’ll first learn how to make vanilla ice cream and that later they will invent their own recipes. Can you make ice cream using the ingredients you’ve been supplied? Separate children into teams of 2 or 3. Distribute materials so that teams are sharing sets of ingredients. This first attempt is mostly about the process and exploring how salt plays a role in making ice cream. Each team will need 1 large (quart or gallon) Ziploc freezer bag and 1 or 2 small (pint) Ziploc freezer bags. Shared ingredients include cream, half and half or milk (½ cup per team), sugar (1 tablespoon per team), vanilla (¼ teaspoon per team), ice (enough for each team to fill the large Ziploc bag halfway) and salt (approximately 6 Tablespoons). Have each team measure out ½ cup of cream, 1 tablespoon of sugar and ¼ teaspoon of vanilla from the shared ingredient cups, and add these ingredients to one of the small Ziploc bags. They should make sure to squeeze out as much air as they can before zipping it shut. If you’d like, you can have each team place this bag inside another Ziploc bag of the same size—this will help to make sure that the bag with the liquid in it does not break. These smaller bags should then be placed inside the large Ziploc bag. Instruct your children to add ice to this large bag and fill it up about halfway, and then add approximately 6 tablespoons of salt to the ice. Have them squeeze out any air in this large bag and zip it shut. Now for the fun part—kids should carefully shake and gently squeeze the bags for 5–10 minutes until the mixture inside hardens into ice cream. Make sure that they are taking turns doing the shaking and squeezing—the bags will get pretty cold. The ice cream won’t be as hard as something you’d buy in the store—it will be more like a hard slush. After your students have been mixing and shaking their ice cream for a few minutes, ask them if they notice anything happening. How do the bags feel? They should keep shaking and squeezing their bags during this discussion. When everyone’s ice cream is done, give kids a chance to taste their creations. Make sure you record how long it took for them to make ice cream. Ask them how it tastes. Is there anything they would change about it? What other flavors might they try? What would happen if they just used ice to make their ice cream? Some of your students may be lactose intolerant. As with any cooking activity, be aware of any dietary restrictions that your children might have. Have some other snack available for these students if you think it is appropriate, but let these students participate. This activity is very much about the process of making ice cream and less about the final product, so any students who can’t eat the ice cream will still get something out of the activity. If the bags feel too cold, you can wrap them in towels. For ice cream tasting, use a method similar to the one used in the Soda Science activities—give each student their own tasting cup or bowl and their own plastic spoon. Each ice cream bag should also have a designated serving spoon that no one uses for eating the ice cream. Scoop out samples of the ice cream from the bag and spoon it into students’ tasting cups or bowls for eating. Some of your students may not be able to use sugar—have sugar substitutes on hand if this is the case. Now that your kids have made some ice cream, have them experiment with the ingredients to learn more about what is going on. 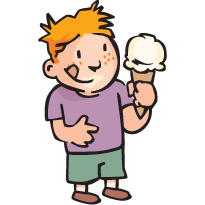 Try the Ice Cream Science – To Salt or Not To Salt activity next, then move on to the other Ice Cream Science activities.